【Aitechny FHD 1080P Video Camera】: 24MP CMOS sensor, 3.0 inch IPS LCD touch screen 270° rotation (16:9).16 X Digital Zoom ，1280*720（60FPS）1080P(30FPS)；Support Night Vision ,support HD output ,SD/SDHC,USB 2.0,support camera tripod/MIC intput/Continuous shooting/Face Detection/Multiple languages . 【Infrared Night Vision Function】The camera is equipped with IR LED Night for taking photos and videos at night. Under the infrared night vision function, the camera can be used as normal. 【Remote Control Function】Mini handhold camcorder, it is portable and lightweight,support remote control and tripod ,you can take photos and videos by yourself anywhere. No members are excluded from the group photo and no longer asking people around to take photos for you. When fully charged, the digital camcorder can work 2 -2.5 hours in different model; capacity rechargeable lithium batteries can be charged in the camera . 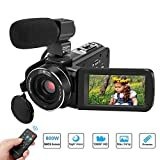 【Multifunctional Camcorder】: Anti-shake, face capture, beauty function, self-timer and webcam function, you can record video directly when the camera is connected to the TV by HD output. Having a video call as webcam with your families or friends when connected with your computer. This digital camcorder is useful for you to capture your beauty face and share in your Youtube. Moreover, the volgging camera supports charge when you are recording. So you can enjoy it anytime and anywhere. 【Camera Camcorder Features】External Microphone, Rechargeable Batteries;A high sensitive external noise canceling MIC makes the video you record have clear and stable voice. It could automatically filter out noise effectively, so that the sound quality is more pristine. 12-Pack various sizes Reusable, Durable and Expandable Airtight Silicone stretch lids for cover cups cans, plates, mugs, cups to keep your food fresh, fit all shaped bowls. Reusable Cable Ties Management Straps -(20 Piece) 6 Inch Strong &Microfiber fastening cloth, Adjustable Fastener Cable Strap Hook and Loop Cord Ties, Black.